Developing an efficient practice routine is one of the most important aspects of being a successful trumpet player. Top NYC trumpeter Antoine Drye explains different approaches that you can use to practicing and warming up while at the same time building your musical knowledge and vocabulary. 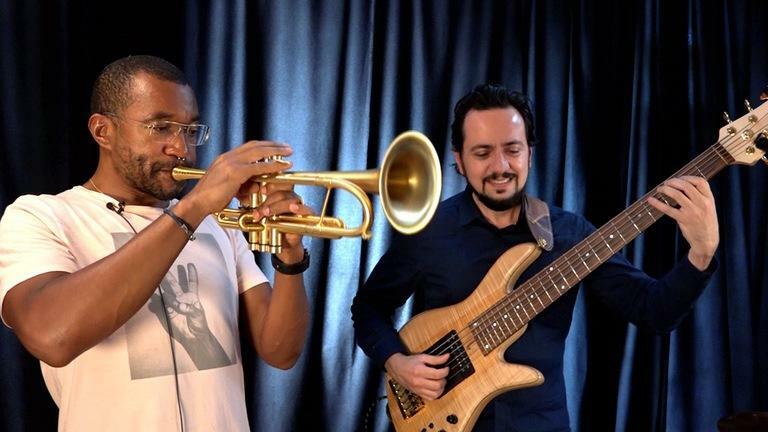 In a casual and jazzy conversation, Antoine discusses different warm-up techniques, such as warming up with a song, playing with a soft dynamic and practicing chord tones from different progressions. In the end of the course, Antoine Drye is joined by Lessonface teacher and bassist Flavio Lira for a jam over three different songs. Having graduated from North Carolina School of the Arts (HS diploma), University of New Orleans (BM) and Aaron Copland School of Music (MM) gives Drye an impressive list of academic credentials. Yet, it’s his on-the-job training that has most significantly shaped his playing and career. Throughout his career, Drye has worked across musical genres with a wide range of artists including Ellis Marsalis, Delfeayo Marsalis, Jason Marsalis, Wycliffe Gordon, Wessell Anderson, Brian Blade, Victor Goines, John Boutte, Kermit Ruffins, Henry Butler, Daniel Lanois, Houston Person, Tim Warfield, Mark Gross, Lafayette Harris, Paul Simon, The Brand New Heavies, Mike Longo, Mark Whitfield, Taylor Mac and Justin Vivian Bond among many others. You may also learn more and save by bundling in two 30-minute private online lessons with Antoine, essentially getting the course for free.